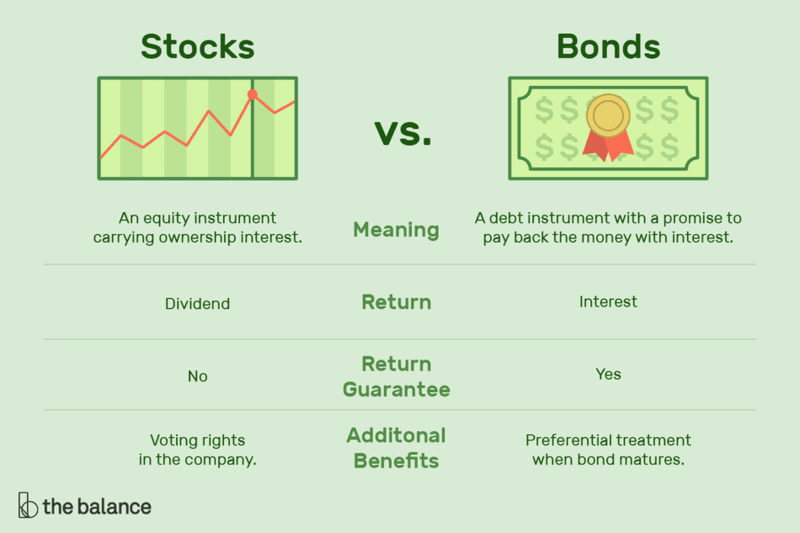 Investors are always told to diversify their portfolios between stocks and bonds, but what’s the difference between the two types of investments? Here, we look at the difference between stocks and bonds on the most fundamental level. Stocks and bonds represent two different ways for an entity to raise money to fund or expand their operations. When a company issues stock, it is selling a piece of itself in exchange for cash. When an entity issues a bond, it is issuing debt with the agreement to pay interest for the use of the money. Stocks are simply shares of individual companies. Here’s how it works: say a company has made it through its start-up phase and has become successful. The owners wish to expand, but they are unable to do so solely through the income they earn through their operations. As a result, they can turn to the financial markets for additional financing. One way to do this is to split the company up into “shares,” and then sell a portion of these shares on the open market in a process known as an “initial public offering,” or IPO. Bonds, on the other hand, represent debt. A government, corporation, or other entity that needs to raise cash borrow money in the public market and subsequently pays interest on that loan to investors. Each bond has a certain par value (say, $1000) and pays a coupon to investors. For instance, a $1000 bond with a 4% coupon would pay $20 to the investor twice a year ($40 annually) until it matures. Upon maturity, the investor is returned the full amount of his or her original principal except for the rare occasion when a bond defaults (i.e., the issuer is unable to make the payment). Since each share of stock represents an ownership stake in a company – meaning the owner shares in the profits and losses of the company - someone who invests in the stock can benefit if the company performs very well and its value increases over time. At the same time, he or she runs the risk that the company could perform poorly and the stock could go down – or, in the worst-case scenario (bankruptcy) – disappear altogether. Individual stocks and the overall stock market tend to be on the riskier end of the investment spectrum in terms of their volatility and the risk that the investor could lose money in the short term. However, they also tend to provide superior long-term returns. Stocks are therefore favored by those with a long-term investment horizon and a tolerance for short-term risk. Bonds lack the powerful long-term return potential of stocks, but they are preferred by investors for whom income is a priority. Also, bonds are less risky than stocks. While their prices fluctuate in the market – sometimes quite substantially in the case of higher-risk market segments - the vast majority of bonds tend to pay back the full amount of principal at maturity, and there is much less risk of loss than there is with stocks. Many people invest in both stocks and bonds to diversify. Deciding on the appropriate mix of stocks and bonds in your portfolio is a function of your time horizon, tolerance for risk, and investment objectives. How Do Economic Growth Changes Affect Bonds?